The designers of the Aprilia RSV Mille could not be accused of muddying their intentions. A lap-timer on a road-bike spoke volumes. Naturally, it would only ever have been used at track-days! Even so, commuting could never have felt more like competing. The rest of the bike was pretty purposeful, too. Which is what you would expect from a machine derived from a World Superbike. Its kid brother - the RS250 - was similarly linked to the bike which took the 250cc GP title. The Mille's chassis was impeccably race-bred. It was secured by a twin-spar aluminium frame. The engine - a fuel-injected 60° V-twin - produced 128bhp. Aerodynamics were as good as a roadster gets. Put the two together - and top speed worked out at 165mph. With so much going for it, the Mille did the business, commercially. 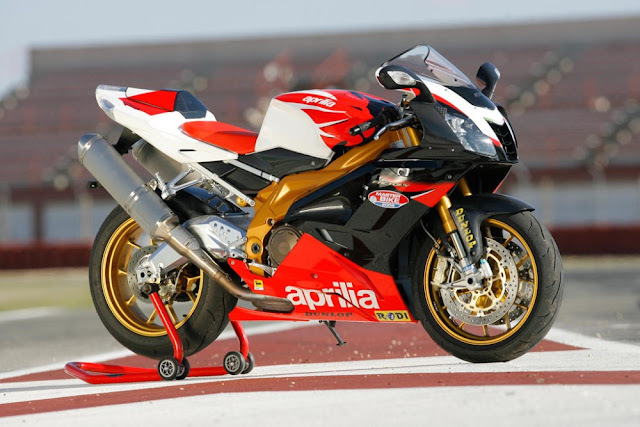 All in all, the Aprilia RSV took its place in the top-flight of Italian sports-bikes.